Understand Al-Qur'an Academy > Articles > DHUL HIJJAH PREPARATION SERIES part 2! Please read part 1 HERE. Let us continue with part 2! Before talking about any voluntary actions (and bonuses), remind yourself to take care of all your obligations. 2.Revive the forgotten Sunnah prayers. The best of all nawaafil (voluntary) prayers is tahajjud, the night prayer. Ask Allah the Most High to enable you to pray it each night in this blessed time. The Prophet said:Whoever sticks to the habit of offering four rak`ah before dhohr prayer and four rak`ah after it, Allah will shield him against the Hell-Fire. [ An-Nasai] Seek this reward and convey it to others! Guard the Duha prayer, two or more (even amount of) rak’ah between approx twenty minutes after sunrise and twenty minutes before dhohr. Revive Salatul Tawbah; after a bad deed pray two rakah of repentance prayer. Get forgiven and rewarded for reviving a sunnah, by the will of Allah! It’s sunnah to recite takbeer (Allahu Akbar), tahmeed (Alhamdulillah), tahleel (Laa ilaaha ill-Allah), and tasbeeh (SubhanAllah) during the first ten days of Dhul Hijjah. Action point:Put a note on the wall (or car windscreen) to constantly remind yourself to recite them (at home or on the go). Feel their meaning in your daily life. Allah is greater than anything (Allahu akbar); put Him first. He gave you everything you have (Alhamdulillah); complain less. 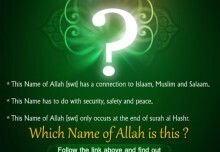 There is only One God (laa ilaaha ill-Allah); truly turn to Him for help and comfort. Glorified is Allah (subhanAllah); know this world is imperfect and our true happiness is with Him, in Paradise! 4.Earn the reward of a Hajj without going to Makkah. Whoever prays Fajr in congregation, then sits remembering Allah until the sun has risen, then he prays two Rak’ah, then for him is the reward like that of a Hajj and Umrah. He said: The Messenger of Allah said: Complete, complete, complete. [Al-Tirmidhi] Action point: Beg Allah to enable you to do this at least once in these blessed days. 5. Fill your seconds with the repeated dhikr. Ten days are 14 400 minutes and 864 000 seconds. On those moments too busy to perform other good deeds, train yourself to keep your tongue moist with sunnah remembrance! Action point: Say hundred times a day: SubhanAllahi wa bihamdihi, subhanAllahil-Ádheem, astaghfirullah wa atoobu ilayh and laa ilaaha illal-laahu wahdahu laa shareeka lahu, lahul-mulku wa lahul-hamdu wa huwa ‘alaa kulli shay-in qadeer. Use notes/stickers to remind yourself! Tip: seek forgiveness for the entire Ummah and you’ll get reward for each one of them by Allah’s will; Allahumma‘ghfir lil mu’mineena wal mu’minaat. Every time you make salah and salam on the Prophet ﷺ an angel goes to the Prophet ﷺ and tells him that son of so and so did salam on you. You attain ten blessings from Allah for every one blessing upon the Messenger, Allah raises you ten level, ten good deeds are written, and ten bad deeds are erased from your record. Ibnul Qayyim, may Allah have mercy on him, described 39 benefits of sending blessings upon the Prophet Muhammad! Action point: You can say Allahumma salli wa sallam ‘ala nabiyyinaa Muhammad or use the last part of prayer. Extra: let the children join and teach them for each blessing they get ten back, get them counting! رَّبِّ ارْحَمْهُمَا كَمَا رَبَّيَانِي صَغِيرًا – Rabbirham-humaa kamaa rabbayaanee sagheeraa– O my Lord! have compassion on them, as they brought me up (when I was) a child. Avoid the two biggest problems we have with this muscle: gossiping and excessive talking. Just like the person performing Hajj must refrain from getting into disputes and acts of disobedience or risk the acceptance of their Hajj, you should try to do the same! Subhaanaka Allaahumma wa bihamdika, ‘ash-hadu ‘an laa ‘ilaaha ‘illaa ‘Anta, ‘astaghfiruka wa ‘atoobu ‘ilayka. A gathering is even sitting with your spouse or children! Finally, if you have not yet fulfilled the obligation of Hajj, make special dua to Allah to grant you the opportunity to do so soon and in the best of manners. In your next sujood- ask Allah to help you make the best of these days. What Qualifies You for Jannah?! Sister in Islaam August 12, 2018	Log in to reply. Ma shaa Allah! BaarakAllahu feeki Sister. I always love to read your articles. They are so enlightening and helpful. May Allah subhanawatala reward you for all your efforts in both the worlds and help us in practicing what we learned from your article .Aameen! Amina Remmy August 13, 2018	Log in to reply. Shukran Jazillaah for sharing keep on sending. Ramatu Alhassan August 13, 2018	Log in to reply. Salisu bn zakariyaa August 18, 2018	Log in to reply. So beneficial messages that you always post.May Almighty Allah continue to bless you and increase you in knowledge , understanding and a firm faith in the good work that you doing.AssalamAlaikum wa rahman Allah. Shia Quran Learning October 2, 2018	Log in to reply. You have shared such a great informative content with us, please keep updating more Islamic content.